Guess who is a DECADE old??? She is my first love….puppy love that is….and this is her story. More than ten years ago, I wanted a male yellow lab. That is what I intended to bring home, and had my heart set on. But all the puppies at the farm that day? They were black. So, I looked for a boy. A cute little boy with a face only a doggy mom could love. I picked him out of all the rambunctious pups and snagged my man. Only, it was a girl. I put her down, and continued my search among twelve CRAZY baby black labs running everywhere. Again, I spotted my pup. So, I picked him up, and took a look. On the search went, from one puppy face to another. I saw them chew ears, bounce, run, and tumble all over each other. FINALLY, I spotted a REALLY cute pup. THIS was it! The ONE. I picked it up, and sure enough, GIRL. Same girl. Same paws dabbed in white. Same pretty face. This time, I didn’t set her down. I knew. I picked that girl out of twelve puppies – three times in a row – she was meant for me. And now, my baby puppy, is ten years old, and the longest live-in roommate I have ever had. We have many memories and journeys together. She is my best fur-friend – loyal, comforting, and always thankful. Many times, hugging her big fur-neck made everything right in my upside-down world. So we celebrate, because, I know………I don’t have many years left. And I will miss her dearly. 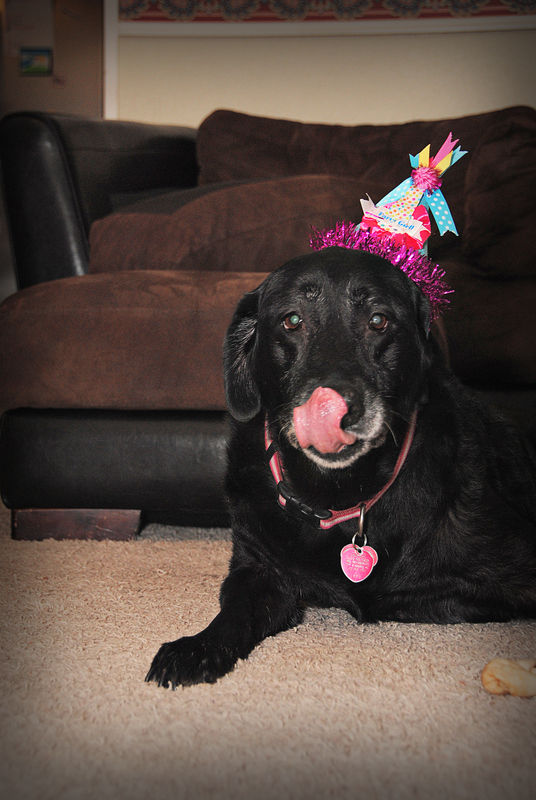 My sweet girl, you deserve a party to remember (if you can). Let’s get it started. Everyone knows a birthday just isn’t a birthday unless you sing, loud, and proud to the Birthday girl. And of course, you invite the very best party guests. My youngest step-daughter, and newest adoptee Fred. 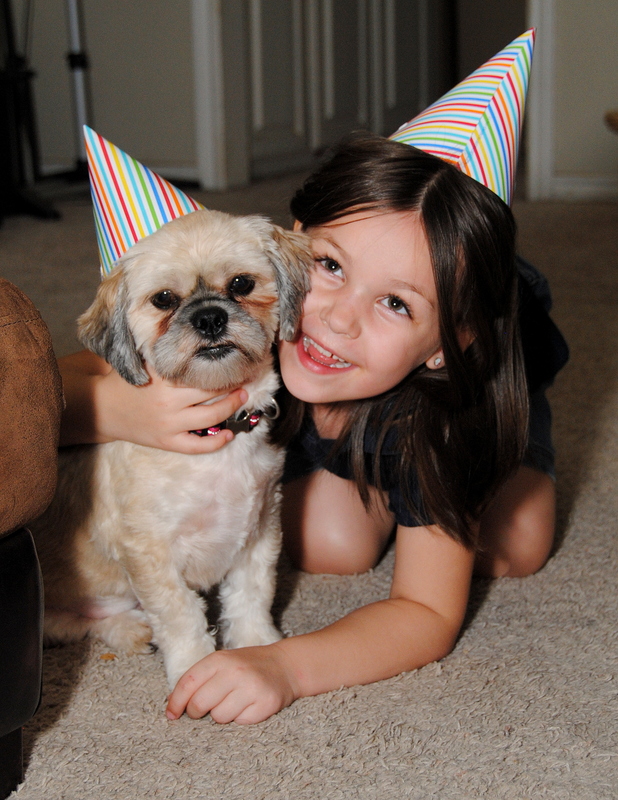 My oldest step-daughter with the baby of the fur family – Miss Brownie (who kinda turned grayie). 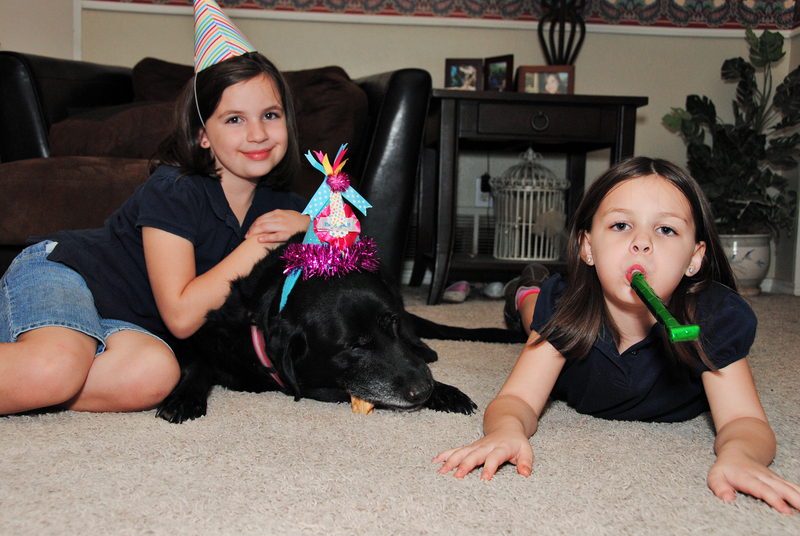 The oldest daughter with the middle dog – Anna. We take celebrating serious in this house. Put on your best party duds, and get wild. Right, Fred? 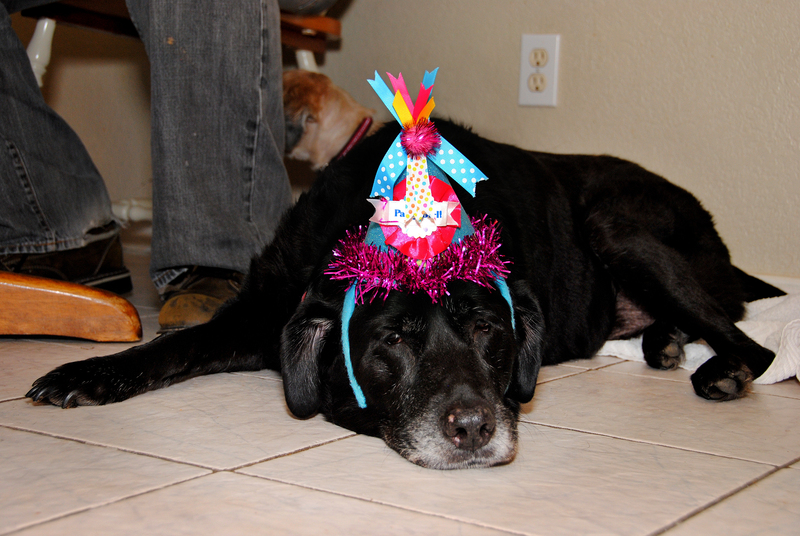 Maybe, the party is a little too much for her (she is 70 in dog years!). 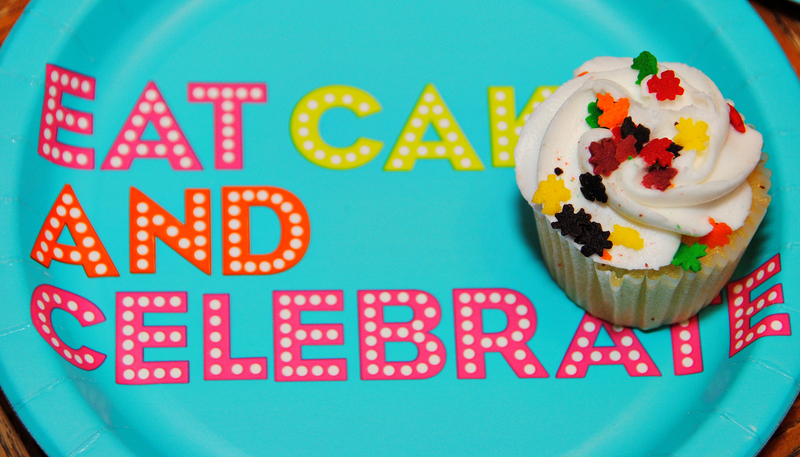 Luckily, we got the cake-eating covered. And don’t worry, Salem got a tasty, beefy raw-hide bone for her birthday. She is my life saver! Oh! That would be soooooooo cute! If you do it, let me take the photos. HA HA. Happy Birthday to Salem. There was that THREE again, huh? Three times is a charm. You can’t really argue with that particular situation. I am glad you recognized that. Hugs to you, all your girls, and your two boys! There is no love like dog love, but it’s really hard when they start getting older and you know they will not outlive you. 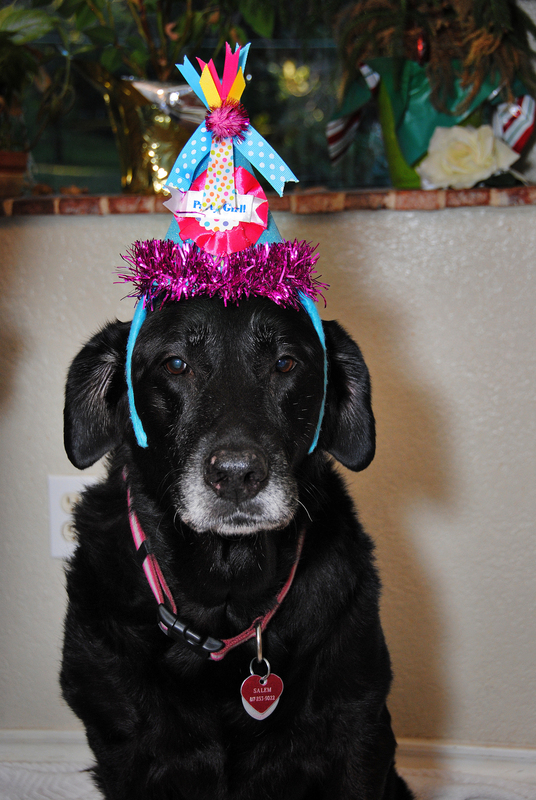 Our Bailey will be 9 in November – she is the black lab/border collie mix. Love your celebration photos! You know just how I feel! I give her extra hugs, and cuddles. Lots of ear pats (just in case). It is tough. Especially when you hear them moan and groan getting up. I had no idea how fast these years would fly by. It’s funny that you always go to pick out a pup and in the end they actually choose you. It is funny that way. I was thinking….well….with Brownie, we didn’t get to pick her. We got her off Craig’s list. BUT, we had a name picked out before we even started looking. 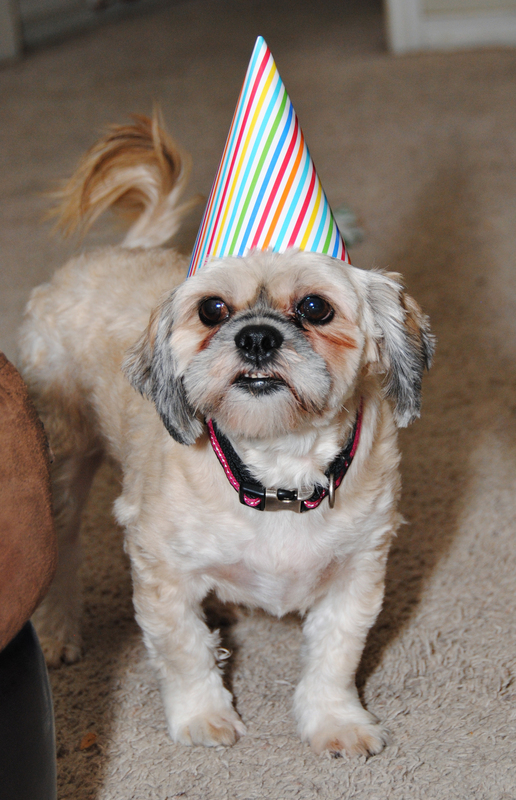 And, I had no idea brown shih-tzus existed. She was the last of her liter. The only one left when we called. Coincidence? Hmmm. I love Marshall. I bet he and Salem would be BFF’s! I’d like to think so, but somewhere along the line, he’s gotten a bit cranky with other dogs. 😦 except our shepherd. He’s getting older. I know how he feels. :-). Man’s best friend! 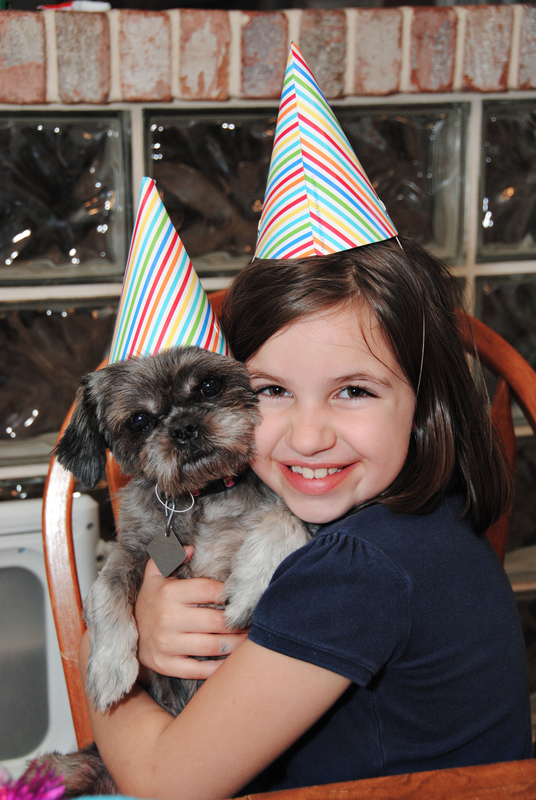 Lovely to see a party being given to a lovely pet! Most definitely a best friend. Although, all the dogs like me better than the man of the house. LOL. Great pictures and a great story!! Happy Birthday Salem! 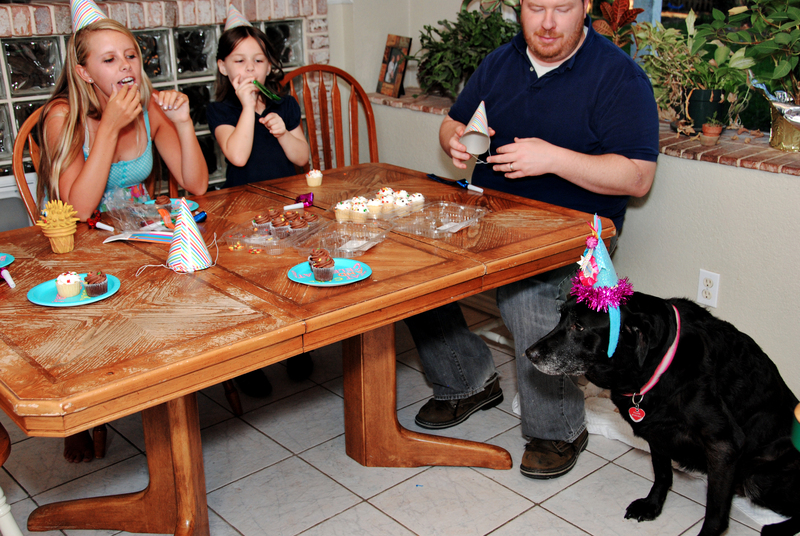 My mom used to make b’day cakes and parties for our dogs when we I growing up. it is so heartwarming to see that kind of love. Jo – That is truly a touching comment. Thank-you! There is magic and wisdom in a dog’s loyalty and love for their owner. It is special indeed. Lovely story.and pictures. Loved your post. Thanks for visiting my blog. What a precious girl! We had 13 wonderful years with our yellow Lab Sandy, and Labs are the most wonderful dogs ever. I wish everyone could have one. Or two! I agree…labs are the BEST. They are so incredibly smart. I swear she understands EVERYTHING I say. They are amazing dogs. Happy Birthday, Salem! It’s funny how we can go in thinking we want one thing and come out with something else! My first cat was meant to be a boy, but I also ended up with a girl. My second cat was meant to be white, but I ended up with another black cat. My dog is probably the one I went in with the least expectations and we fell in love with him as soon as we saw his ears. They’re all getting on in age, as well, and it makes me tear up even thinking about it. Let’s hope we have many more years with them all! What a fun, happy Birthday party with lots of warmth and loving memories. She is adorable. The story you found her and won your heart is beautiful. So much love and joy in your family…thanks for sharing all these! 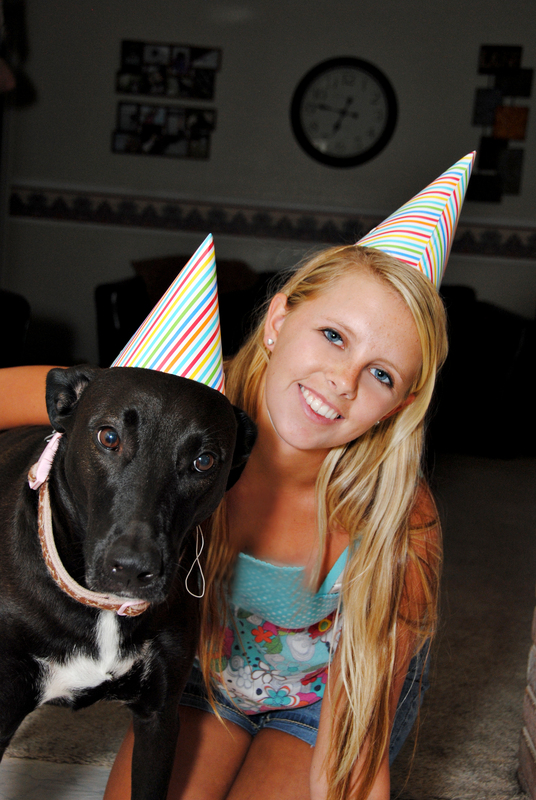 I love that your dogs wear party hats! So freaking cute!! Love the photos and such a great story of how you found each other! Happy birthday to Salem! 🙂 She’s definitely meant to be yours if you picked her three times from out of the 12 puppies in the litter. You are welcome. Third times the charm. Salem, you are beautiful and so loved! Wonderful photos Angelia; this post warmed my heart through and through, Thank you. Awe…thanks Larissa! She is a precious girl. Oh, Angelia, you bring the best stories to share with us…Salem and all your other furry friends are adorable. Thanks for sharing this precious family moment. Oh, I had to snap photos mighty quick. They did not wear their hats happily for long. LOL. 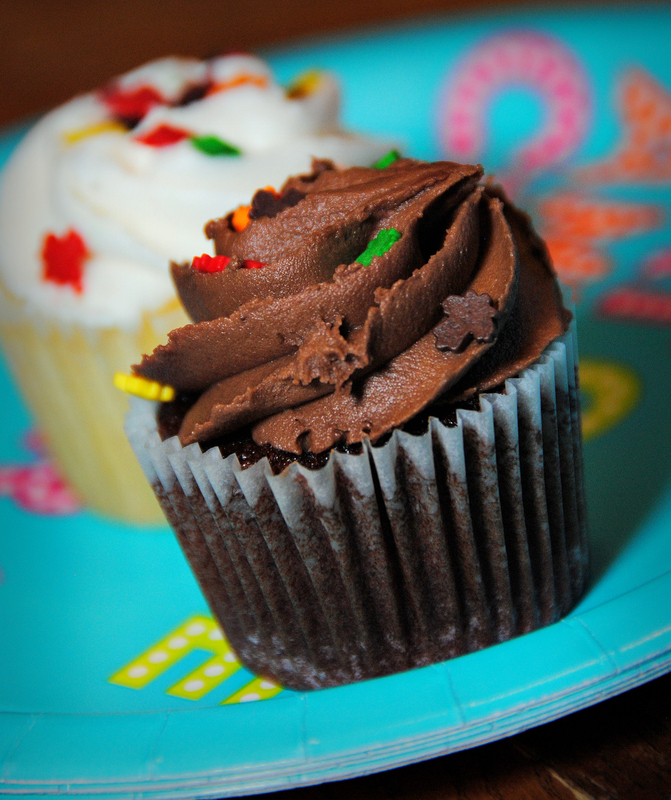 Yes…yummy, yummy cupcakes! Thank-you! I’m sorta glad I’m not 10 (or 70!). HA! Hey, sweetie! And YOU are just as sentimental as ever! Well, I am, too. We love our dog children, and now we have a cat since we have moved to Brunswick. She adopted us a week after we moved in, and we named her Violet. She is a nice addition to our little family. Happy birthday to your sweet girl. Awe Judie! How cool is that? A new kitty just for you. Glad the new place is working out. The two of you were meant to be 🙂 awww she’s adorable even at 70. Happy birthday Salem! What a precious girl she is! I can relate to having had a pet for so long that he/she has been through many significant life events…it’s a gift for sure! Lovely post! You are a kind soul Angelia. Thanks for reminding all of us that we need to celebrate with these innocent souls who give us so much happiness, support and love without seeking anything else other than the same amount of love and attention from us. Thank-you sweet Arindam! They are deserving. God’s creatures for sure. I never thought I would be a “dog person”. I liked fish. I adapted to frogs. But then Andy talked me into a dog. And I can’t imagine life without Daisy. She is my baby. I was just taking her picture today actually. When I was snapping pictures of the boys in the backyard I couldn’t resist a few of her too, even though she hates it! So cute! 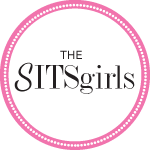 Love the dogs and the girls. You will always be the best story teller of the family! I love reading your writing because I can hear you saying it and them cracking up…love you guys! I thought of you today! I found a picture of one of the kitties in the Christmas tree (yes…THAT year). I thought you WOULD LOVE to know that. Maybe, a blog post coming soon on that one….LOL.